Leaders in Health Beauty Care Supplies. We have over 60 years experience in the Distribution of wholesale health and beauty care. We offer prompt service and speedy distribution across the USA and Abroad. Each category of our Health & Beauty Care Distribution catalog holds all of the top Health Beauty and Wellness Products at the best prices. SDA wants to save you thousands of dollars per year! What is Special About our Wholesale Products Business? Over sixty years of service to Drug stores, Supermarkets, Convenience stores, Country Clubs, Colleges, and a variety of other retail establishments. Our popular Acne Treatment Products contain wholesale skin products and acne treatments such as Neutrogena Acne oil-free wash, Galderma's Cetaphil cleanser. Clearasil creams, Aveenobar, Stridex, Clean and Clear gel. Antacids for people with chronic heartburn. SDA stocks a large assortment of Antacids. Prilosec, Pepto Bismol, Alka Seltzer, Tums, Pepcid and Zantac are just a few of the antacids we distribute. Pepto Bismol Maximum Strength Liquid 8.oz can prevent heartburn. Its gentle formula ensures eliminating the 5-symptoms that follow the most spicy meals. We have all the Baby needs for your children, from Johnson & Johnson baby bath, wholesale baby lotion, wholesale baby oil, wholesale baby wash, and wholesale baby powder, to Balmex and Desitin ointments for diaper rash. We carry all of your wholesale shampoo and wholesale baby supplies. NUK Baby Products. We carry many brands such as Munchkin Baby, Dr.Browns and Dr. Bronner Baby Accessories. When it comes to batteries, have we got the best deals for you! If you think that Duracell batteries are the best choice, we can give you super pricing on every one of their products. From Duracell Coppertop AA, AAA, C, D, 9volt, and Ultra batteries, to Eveready AA & AAA batteries.This is an important category to view and stock up on. You can treat all those cold symptoms with a vast assortment of cold liquids from Robitussin to Tylenol Cold. There also are generic cold products available that are equivalent to all the major name brands. Many find it easy to take these products in a liquid form especially for children. Many of our liquid cold products are sold in tablet or caplet form. They relieve your cold and flu symptoms just as well as the liquid. Many do not like the taste of medicine and prefer it in tablet form. If you need a Q-tip cotton swab to clean your ears, or maybe a safety swab to care for your infant. We carry cotton balls and cotton rounds, to wipe your make-up off, It's all here. Just look in our cotton-needs category. We carry many varieties of cough drops for you to choose from. There's a cough drop for when you have that cough that won't quit like Halls or Pine Bros, which come in a variety of flavors. To soothe a sore throat you can use Luden's or Ricola, which is a natural herb throat and cough drop. Have you had dental work and you need some denture products? If so, check out our selection of the most popular solutions such as Efferdent & Polident cleaners, Fixodent & Poligrip adhesives, and Sensodyne toothpaste for those sensitive teeth. Do you work out, or just work hard every day, and need that deodorant or anti-perspirant control. Well, we've got the world of choices for you! The tops brands like Axe, Brut, Dove, Degree, Lady SpeedStick, Mennen Speed Stick, Mitchem, Gillette, OldSpice, RightGuard, Series, and Secret are in stock, just to keep you from sweating all day! You'll smell fresh and clean. If your a women who doesn't like to get cut shaving your legs, or other areas of your body, then try Nair, Veet, or Jolen products to remove that hair easily and pain free! For those that are conscious about their weight we supply Taylor scales. There are digital scales and also the regular dial types. We also carry scales that displays body fat and kitchen scales to weigh the amount of food accurately for those of us on a diet. Like many people today, contacts are a way of life. We have all the Bausch & Lomb, Alcon eye care products you need to keep your eyes moist and clean. Rinse your contacts and wash out your eyes. Our selection of Visine and Clear Eyes products will "keep the red out" and make your eyes feel good. Many people have dry, sensitive or damaged skin and need to care for it in different ways. Pamper your skin with Aveeno, Curel, Cetaphil, Eucerin, Jergens, Keri, Lubriderm, Nivea, Neutrogena, Noxzema, Olay, Ponds, Palmers, St.Ives, Suave & vaseline Intensive Care lotions, creams, and cleansers. Whether your skin needs aloe, cocoa butter, vitamins A, B, c, E, or other vitamins & minerals to repair it's beauty, you will find the one you need. For all those accidents that happen throughout the year in your home, with your children, or at work, we have a first Aid category that can treat your condition. From Johnson & Johnson Bandaids, tapes, gauze pads, to Bacitracin, Cortizone-10, Cortaid, Alcohol, Peroxide, Neosporin, Anbesol, Bactine, Benadryl, Caladyrl, Digital Thermometers, Epsom Salts & First-Aid Kits to travel with, you will be well protected visiting this section of our catalog. Exercising, whether in a club, or at home, gives your feet a workout. Make them feel better with Desenex, Tinactin, Goldbond, Dr. Scholls & Lotrimin foot products. Get rid of the itching, tired, smelly feet, and remove undesirable calluses and corns. Make those sneakers or shoes more comfortable with a Dr. Scholls gel or cushion insole. Hand Sanitizers, Liquid Soaps, Towelettes, Lens Cleaners, Personal Care Products, Shaving Supplies, First Aid Kits, OTC Medicines, Sewing Kits, Shower Caps and Petroleum Jelly. If you need some more body or shine in your hair, then check out our Hair Conditioner selection. Whether you like Pantene, Fructis, Dove, Flex, or Vo5 to give you the bounce your hair needs, the many choices we have are sure to make you smile. If you like to act like Elvis, or just grease-up your hair, we've got the styling gel for you. Use Dep, LA Looks, Studio-Line, Fructis, Nexus and Pantene gels to give you that special look! Got a migraine? Too much stress at the office? Try some Advil, Tylenol, Excedrin, or Aleve for your headache and pain relief. We even have Bayer, Bufferin, Anacin, and all the other varieties of name brand and generic Health Beauty Products you like. From pet supplies to household items. Sda carries candles, paper goods, mouse traps, strainers and so much more. We stock pain relief patches, ointment, balm, rub, and creams in our Liniments Category. Do you have chapped, cracked, or dry lips? Just check out our Lip Products category and find Chapstick, Blistex, Carmex, Softlips, and other top lip care choices. Your lips will look beautiful in no time! Tired of having bad breath? Going on a new date? It only takes a minute to rinse that bad breath away with our selection of mouthwashes. Whether you like Listerine, Scope, Plax, Act, Crest, Toms, or a cheaper generic version, you will have fresh breath in no time! Just went to the beach and you’ve got sand in your hair? Go to our shampoo category to find that perfect Shampoo solution to clean hair. You will only find the top brand names are in our wholesale catalog. Choose from Pantene, Fructis, wholesale Head & Shoulders, PertPlus, Suave, Vo5, Dove, Flex, Finesse, and many other choices that will do the job! Quitting Smoking is not an easy task. There are many over-the-counter alternatives. Some common product options are nicotine lozenges, patches and gum to help you stop smoking. For the man or women that wants the best possible shave, you must have a Gillette product on your mind. Whether you need Mach3, Fusion, Daisy, Goodnews, Venus, or Sensor razor blades or refills, it’s all in our catalog at fantastic pricing. If you need an inexpensive disposable for a trip, try the Bic shavers in sensitive or lady’s. We even have all the Schick choices too. For women in need of our feminine care products, you want the top brand name tampons and maxi pads to help you out. That’s why we carry a full variety of Tampax, Playtex, OB, Stayfree, Always, and Kotex products. We carry all Summers Eve & Massingil feminine douche product. Find feminine douche, wash, Wholesale Bath, Powder, Spray, and wipes to keep you fresh and clean. Worried about getting burned? Have you already got a sunburn? Do you want to cook in the sun? We can provide you with the Coppertone, Solarcaine, Banana Boat, or Neutrogena products that will give you the protection you need or desire. If you care about your teeth, then you will visit our Toothbrushes category to find the Oral-b, Crest, Colgate, or Reach products to keep your teeth pearly white. Don’t forget to buy the Glide floss to, if you care about your gums. SDA supplies toothbrushes in bulk quantities. SDA warehouses wholesale toothpaste and whiteners. Whether you like Colgate, Crest, Arm & Hammer, Ultrabrite, Mentadent, Close-Up, or some other toothpaste choice, they will all work to keep your mouth fresh and your teeth their whitest. Try Vicks NyQuil Cold and Flu nighttime relief that contains 16 liquicaps to provide relief from some of the most common symptoms of cold and flu. It keeps cough, runny nose, sneezing, body aches and fever from developing and interfering with your sleep. Now you can enjoy a full-night’s sleep without worrying about your health! On days when you feel down and out, you should rely on the fast-acting relief provided by Vicks’ Dayquil Cold and Flu 8 oz. Its alcohol-free formula is non-sleep-inducing and, thus, perfect for those mornings when you are down with a cold, but have to show up someplace important. It relieves you of flu-like symptoms – headache, fever, sore throat, nasal congestion and cough so that you feel rejuvenated, every day! Eating the right foods and taking vitamins, multivitamins and supplements are some of the way to improve your life. At SDA we have One a Day, Centrum, Emergen-c, Sundown and Nature's Bounty vitamins. SDA Purchases Products Directly from Every Manufacturer. We have all the hottest brands direct from the manufacturer, Bar Soaps and Wholesale Body Washes, we have all the hottest brands that you love. 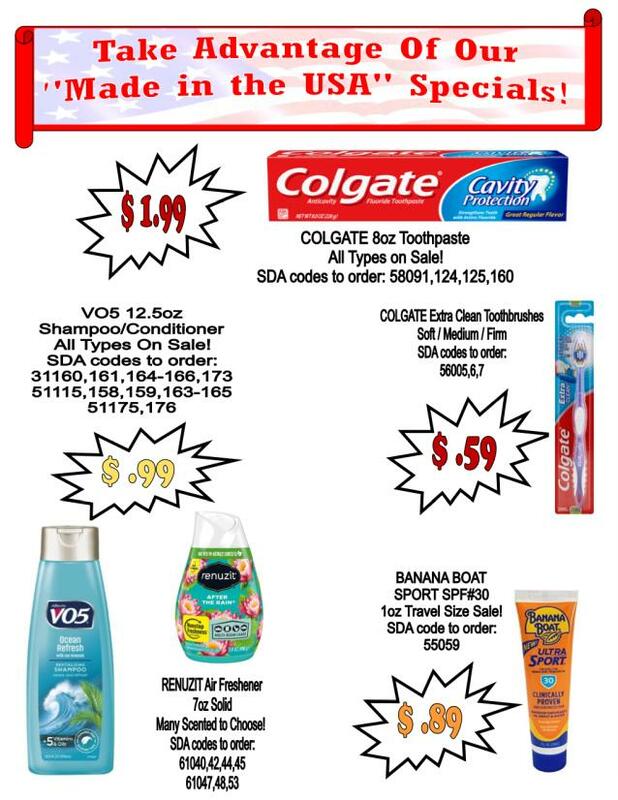 From Wholesale Axe and Old Spice, to St. Ives and Olay, we carry what ever you use everyday! Keeping your shoes in tip shop shape is a KIWI job! We have every Kiwi product to clean, wax, and shine any shoes, boots, or sneakers you own. We even have a variety of laces in many sizes too. During the summer, with all the heat and humidity, using some Aquanet, Rave, or White-Rain hair spray will keep your hair looking great. You can find it all in our Hair Spray category along with many other brands. We also handle a variety of wholesale general merchandise products that come in handy and are priced way below the competition. From coloring books, Crayola crayons, Bic lighters, Bicycle Poker cards, JVC vhs tapes, Krazy Glue, to Playtex Handsaver gloves, sewing kits, Scotch Tape, and Wet Ones wipes, you’re bound to find a few things that you need. Have you not been getting enough fiber in your system lately, or have your meals backed you up? The remedy for you can be found in our laxative Category. You’ll find Exlax, Fleet, Imodium, Metamucil, Kaopectate, and Prep-H to make you feel better. Sick of going to the store and paying $5-10 or more for hair brush? Paying $2-4 for a comb? Do not hesitate to check out our Wholesale Hair Accessories selection. All out hairbrushes are top quality made, but will only cost you $1-2, and our combs are all under $1. You will save big-time with these deals! If you’re a women who likes to color your hair, then stop in our Hair-Color section and check out the shades we carry. Whether you like Loreal’s Preference, Garnier Nutrisse, Clairol’s Nice&Easy, or Revlon’s Colorsilk, we’ve got the color for you. If you’re a man that is considering changing your gray hair back to your youthful hair color, try the men’s hair color choices of “Just For Men”. You can even color your sideburns, mustache, or beard too! Choosing the right shave cream or gel is important to keep your face smooth and shave comfortably. If you love the foam, then chose Barbasol, Foamy or Noxzema. If you like the lather of a gel, then go for Edge, Fusion, Series, or Skintimate for the care of your face. Are you an AquaVelva man? Do you remember the Clubman products from you barbershop? Maybe you go for Brut, Mennen Skin-Bracer, or Old-Spice? Whichever is your choice, you can buy them all in our After-Shave & Cologne category. Are you having trouble sleeping or staying awake? Try one of the sedatives or awakeners we carry to get the rest you need, or the energy to study for that all-important test. Tylenol PM, Excedrin PM, Advil PM, etc. will help you sleep, while Vivarin & Nodoz will keep you up all night if you like. If you are on the go, and travel around a lot, check out our travel size toiletries & trial-size selection. We have a variety of items that will cover you while you are far from home. From Scope, Crest, Colgate, Edge, Pantene, Lubriderm & Right Guard, you can travel lightly and have the best choices on the go.